This installment of the Threats-series for LoGaS clocks in at 17 pages, 1 page front cover, 1 page editorial, leaving us with 15 pages of content, so let’s take a look! Following the tradition of LoGaS-supplements, the content herein is framed by a well-crafted frame-narrative and provided in well-written prose. This prose guides us, via speculations and potential truths a GM can use and treat as correct (or incorrect!) through the depictions of the Annunaki. But what are they? The strangely and suddenly appearing Annunaki are creatures of Eidolon, usually depicted as glowing diagrams drawn into thin air and moving akin to a roughly humanoid shape. The anecdotes of Annunaki influence are diverse – from a hidden conductor of a civilization’s development to an acceleration of technological advancement to the point of the disappearance of all humans, there is, obviously, a plan guiding the actions of the Annunaki – though whether benevolent or hostile – ultimately, their morals are beyond us. As beings of lines and nodes of energy, their lights and pulses can extend beyond a dimension, its very presence a glimpse at the eidolon’s uncanny perfection. It shouldn’t come as a surprise that the annunaki do have some subtypes that have been observed more often than once, the first of which would be the exemplar of blades -fully statted, these Vitruvian Man-like conglomerates of limb-like light-structures are truly dangerous, powerful adversaries. Beyond these warriors, annunaki that adhere to the role of “The Namer and The Shaper” are meant to assume control and guide people and whole civilizations. Oh, and then there is the “Crawler Upon the Stair” – a rather huge and highly disturbing annunaki that seems to be chronicling the Grand Stair – if you see it, RUN! Annunaki can choose the 10-point power Imperatives – phrased in the ur-language Logos, these effects do not require prior knowledge of a creature’s true name, compelling obedience similarly to an invocation. Personally, I would have enjoyed a slightly different way for resisting these imperatives, but that may just be me. Also for 10 points, annunaki can teleport, but only within a gossamer world or within the Grand Stair, not between planets. Also for 10 points, annunaki can choose Eidolon Stasis, by which they can suppress any Eidolon mastery but their own, hampering reality-changing effects. This ability, to me, is a bit opaque, even within Diceless’ relatively free-form narratives – increasing power for more points would have imho made this a more compelling option, especially seeing how annunaki are creatures of eidolon. 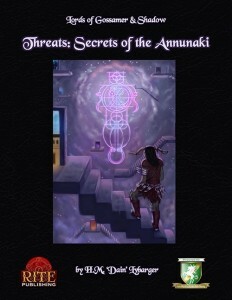 The relentless logic that makes the annunaki dangerous is further highlighted in a compelling excerpt from the journals of a master of Eidolon, before we are introduced to what makes LoGaS-threats usually interesting -the theories and options – much like previous installments, the annunaki sport options to choose from, theories. this dossier’s theory on form and the relation to function, for example, makes sense; as does the theory of their existence (or presence) being tied to their function. The utterly terrifying revelation that continued conflicts with annunaki may engender is also a narrative gold nugget: What if you found out that a fundamental part of reality itself wanted you dead? Frightening, even for an accomplished Gossamer Lord/lady! It should also be noted that this pdf makes one thing very clear: Eidolon Mastery is anything but that – mastery implies subservience, when in fact, the very principle might, deity-like deem to grant a tiny fraction of its power, as it follows its relentless plan. The advice on using them further expands these dimensions – from reality-debuggers to annunaki at war, the hooks provided are intriguing – eliminating disturbances, promotion of a sense of cosmic equilibrium, modification and evolution of Eidolon itself, a war versus the agents of Umbra – the hooks are inspired. For truly apocalyptic options, what about an alliance between Eidolon and Umbra to take control of the Grand Stair, with your PCs in the middle of the conflict? And what if the Eidolon is actually the collective will of all annunaki, the respective individual manifestations only being temporary extensions of the massive will cosmic? What if the Dwimmerlaik’s channeling is actually the antithesis to the Eidolon? On a narrative power-development level, we do receive information for extending eidolon mastery to also be capable of annunaki-like-feats. Players may have their own annunaki for 5 or 10 points – but, alas, the creature is neither loyal, nor beholden to the character, following its plan and agenda and potentially, there is also the option to have annunaki capable of wrighting. And, as the final piece of prose reminds us – the Eidolon is ALWAYS listening…deceiving it is impossible…or is it? Editing and formatting are very good, I noticed no significant glitches. Layout adheres to Rite Publishing’s nice two-column full-color standard for LoGaS, with a significant array of beautiful, original full-color artworks provided. The pdf comes fully bookmarked for your convenience. This is the first supplement by H.M. “Dain” Lybarger I have reviewed and it proved to be a surprisingly awesome read. When I first understood what annunaki were and saw their imagery, I thought “bland.” I shouldn’t have – the annunaki are beyond what I would have expected from hyper-lawful beings – while their imagery, at first glance, may be slightly less evocative and fearsome than other threats in LoGaS, actually using them and depicting their merciless advance, their relentless determination can make them very frightening foes indeed. Add a sense of a cosmic plan that tries to destroy you and we have a scenario for a rather brutal campaign – in fact, much like the angels of Neon Genesis Evangelion (Yes, I LIKE NGE! ), the annunaki can be pretty and wondrous, but at the same time, their goals do not align with those of mere mortals…or even gossamer lords and ladies. Ultimately, the annunaki are a well-crafted adversary-type, one I thoroughly enjoyed – but at the same time, I found myself wishing that the Eidolon’s structure were reflected in more detailed variants of the powers with better defined parameter groups – I’m aware that this is uncommon in Diceless, but it would have constituted an option to make Eidolon also feel different on a meta-level. As provided, some powers herein feel a bit chaotic in the scope they offer. This may be me, but my players remarked a similar observation and this component did somewhat continue to irk me. Now, please remember that this is me complaining at a very high level – this is still a fun supplement indeed, but, to me, slightly short of excellence. hence, my final verdict will clock in at 4.5 stars, rounded down to 4 for the purpose of this platform.